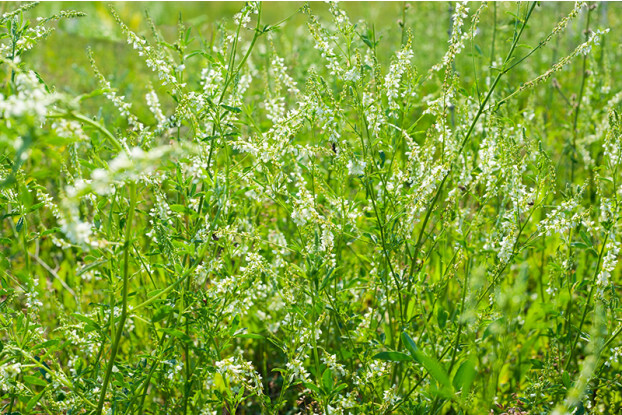 White sweet clover is very similar to yellow sweet clover, but produces white flowers instead of yellow flowers. Also has a slightly different bloom time. White sweet clover is a biennial broadleaf legume introduced from Asia. Considered a weed for many years, today white sweet clover is valued as a green manure, forage legume and honey plant. Can grow up to five feet tall during its second year. White sweet clover is very adaptable and can be found growing in a wide range of conditions. Very drought tolerant. Can become invasive in some areas. It can be cut for hay, included in pastures or used to improve soil.